Dow Gutters, LLC installs seamless gutters on new and existing homes and businesses, throughout Central Connecticut. We install the finest quality custom-fit seamless gutters and downspout systems at the most competitive prices. Our gutter systems can be installed on both residential and commercial properties. We have installed thousands of gutter systems in Connecticut’s ever-changing climate, from new and existing residential homes to entire condo complexes . We are highly skilled and knowledgeable in completing the simple, straightforward job to the most demanding and complex installation. No job is too big or too small. All of the gutters we install are made on site and we can match or blend almost any color. We do not re-use parts or damaged materials. Our gutter systems are guaranteed to protect your home from water damage. Our gutter system will collect the water as it comes off the roof and re-direct it away from the structure to help control water runoff, preserve landscaping, prevent basement flooding and foundation damage. 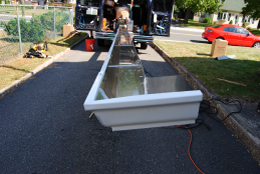 We guarantee proper pitch to drain installation on all of our seamless gutters.